May 2 was being talked about as a historic day in the sports world for weeks leading up the big day. There seemed to be something for every sports fan on this day, topped off with a mega fight that somehow had more manufactured hype than the NFL Draft. The National Hockey League kicked off the day with a great playoff game between the Washington Capitals and New York Rangers. This game had everything the league could ask for: an early goal to get the casual fans attention, and a one-goal finish giving the ending the ability to captivate those fans for the entire game. Let’s not forget a crazy good playoff atmosphere at the Garden to top it all off. The last four rounds of the NFL Draft were a nice appetizer going on in the background, but it didn’t stand a chance at getting any of my attention during this afternoon. I’m told the Premier League also played matches on May 2, but I’m not even going to try to pretend I didn’t just now look up the scores. I completely forgot baseball’s best rivalry also took place, and to be honest still don’t know who won. The Kentucky Derby captured my attention from about 4 p.m. until the 2-minute race was over at around 6:45 p.m. (EST). The run for the roses is always a cool event and had a pretty good finish as American Pharoah won the first leg of the Triple Crown. The main event was up next on this get-your-popcorn-ready full day of sports, and I’m not even talking about that thing everyone paid 99 dollars to watch. A first round series in the NBA Playoffs had the feeling of a conference finals, and Game 7 lived up to those expectations on the entertainment scale. The immortal San Antonio Spurs were at the Staples Center to take on the Los Angeles Ballmers Clippers. The game went back and forth for what seemed like the entire second half and was decided by a running bank shot over two Spurs by that guy you see in all of those State Farm Commercials. Cliff Paul’s twin brother, Chris, made the eventual game winner on an at least tweak hamstring and sent his team’s owner into a frenzy… a frenzy almost as good as when Fergie was playing at the Staples Center. I’ll just say this now: this game was the most entertaining event on this historic sports day, and that is not me being a basketball homer one bit. Once Game 7 ended it felt like an eternity until what was supposed to be the real “main event” started. It was even delayed 30 minutes because so many people were purchasing the fight on Pay Per View. By the time the most anticipated fight I can ever remember started I was ready for bed. Floyd Mayweather did was apparently he always does: play great defense in the ring. I get Floyd is one of the best and smartest boxers ever, and I get the amount of money made from this fight is absolutely ridiculous, but I’m sorry, I found myself not really entertained. C’mon, boxing, you had one job: entertain the millions of people watching to give your sport a chance of not going back into irrelevancy when everyone woke up the next morning. I can totally see how and why boxing used to be “the main event,” but this fight did nothing to revive the sport. Maybe it was impossible for the Mayweather/Pacquiao fight to live up to all the manufactured hype surrounding it, but I know it definitely did not live up to my expectations when it comes to entertainment. The most entertaining thing that took place on the greatest sports day of the year was hands-down a professional basketball game, and it makes me happy that some things lived up to the hype. -The Hawks are in trouble if their big man aren’t healthy. The Wizards have somehow found the switch and flipped it thanks to playing Paul Pierce at power forward more often. It’s pretty crazy that the exact thing that kick started Brooklyn last year is working for the Wizards this year. I really like house of cards comparison Bill Simmons made about the Hawks, and it seems two of those cards will be huge liability in this series for the top seed. -LeBron James is going to have to play more power forward for the Cavaliers against the Bulls, and I’m not exactly sure who that favors. With Kevin Love being out indefinitely with a shoulder injury that people like to think was caused by a “dirty play,” the Cavs are going to have to dust off some of the players on their bench. The Bulls should be able to take advantage of the Cavs small lineups, since the Cavs offense will struggle if they have Tristan Thompson and Timofey Mozgov on the floor at the same time. But this Chicago team is one of the most inconsistent I have ever seen so it all depends on what Bulls team shows up. We are all going to witness just how valuable Mike Conley Jr. is to the Memphis Grizzlies. First off, Conley’s injury looked really bad and I hope he can come back and be at least 75 percent of himself for Game 3 in Memphis because the Grizzlies without him will be down 0-2 heading into that game. Playing Courtney Lee at “point guard” worked, but the Grizzlies still lack the defense at that position that Conley brings. The Warriors turn defense into offense so fast, so controlling the pace is going to be huge for the Grizz, and having their starting point guard back will definitely help. -GM Doc is going to realize how important a bench is against the Houston Rockets. I mean, c’mon, he has to eventually right? The pace of the games in this series are going to be nothing like what we just saw in the Clippers-Spurs series. The Clippers just beat the defending champs playing their starters big minutes, so I am very interested to see how much of impact that has on this series. The Rockets have gotten production out of their bench even with two of their key players being injured, and that will be a huge difference in this series. Dwight Howard looked like Dwight Howard in the Mavs series, but Blake Griffin looked absolutely dominant every game against the Spurs. This could be one of the most entertaining series to watch on a nightly basis, as long as neither team goes to Pop’s “Hack-a-Player” strategy. 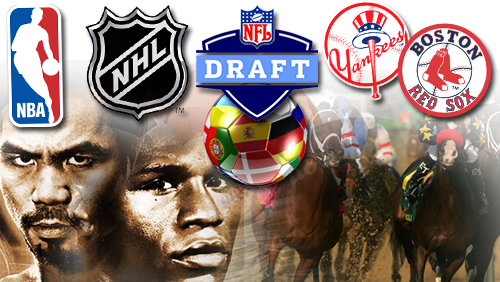 This entry was posted in Home, NBA and tagged American Pharoah, Are you not entertained, first round, Floyd Mayweather, Game 7, Kentucky Derby, Las Vegas, Los Angeles Clippers, Manny Pacquiao, MGM Grand, National Hockey League, NBA, NBA Playoffs, New York Rangers, NFL Draft, NHL Playoffs, Paul Pierce, Premier League, San Antonio Spurs, Staples, Staples Center, the fight, The Kentucky Derby, Washington Capitals, ZML. Bookmark the permalink.